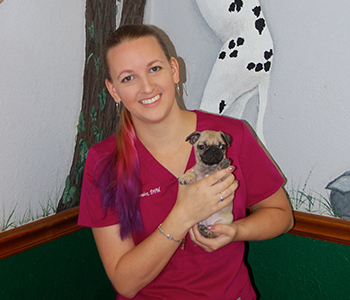 Rhiannon Gonzalez, DVM (Doctor of Veterinary Medicine) grew up in Collinsville, OK and attended Oklahoma State University where she earned two bachelor’s degrees, zoology and microbiology, before attending veterinary school. She graduated from Oklahoma State University in 2015 and started working with Dr. Carley at Hunters Glen Veterinary Hospital shortly after. She has been happily married since 2008. She and her husband have a happy four-legged family composed of two dogs and two cats; Bailey, Vesper, Rigby, and Oliver. She enjoys attending concerts in her free time and visiting Portland, Oregon whenever possible.